Don your skates and glide around the glittering ice rink set within the hugely popular Hyde Park Winter Wonderland which seems to get bigger and busier every year. The UK's largest outdoor Ice Rink - it's over 1,600 metres square - is located around the picturesque Victorian Bandstand on which bands play live music throughout the day and night as skaters take to the ice, illuminated by over 100,000 lights. Those feeling wobbly on the ice can hire an ice guide who can look after up to 15 skaters and guide the group for the one-hour skating session. Children of all ages can skate but those aged 12 and under must be accompanied by someone aged 16 or over. Leave plenty of time to get there - there are so many Christmas attractions on offer as you make your way through the Winter Wonderland to the ice rink, distraction is inevitable. 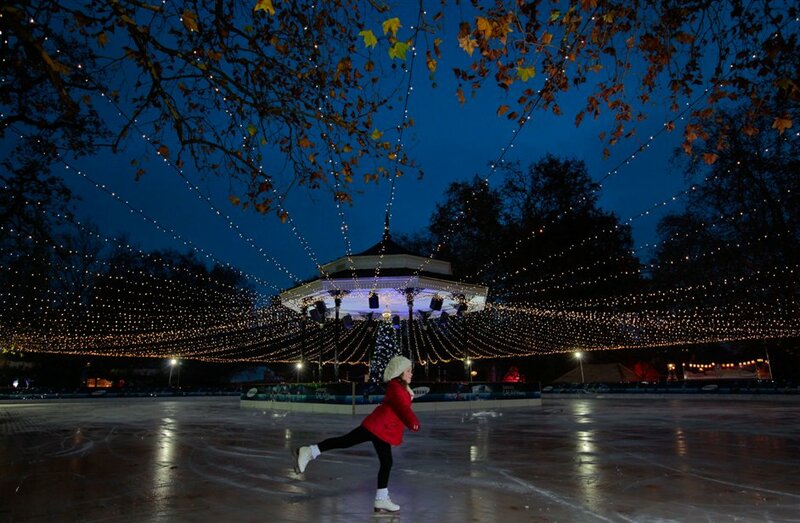 What are the best dining options near Winter Wonderland Open Air Ice Rink London? Winter Wonderland Open Air Ice Rink gyms, sporting activities, health & beauty and fitness. The best pubs near London Winter Wonderland Open Air Ice Rink. Winter Wonderland Open Air Ice Rink clubs, bars, cabaret nights, casinos and interesting nightlife. Where to have your meeting, conference, exhibition, private dining or training course near Winter Wonderland Open Air Ice Rink.